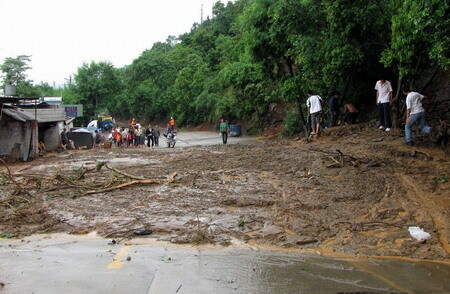 Heavy rain and flooding killed 22 people and injured 41 others in Miyi County of Panzhihua City in the southwestern part of Sichuan province on Monday, according to people.com.cn, the website of the People’s Daily. Seven others remain missing. The People’s Daily also reported that the storm, which caused several flash floods, has affected 69 villages and 103,115 people in Miyi County. It has also caused 194.2 million yuan (US$28.4 million) in damages. Authorities sent emergency rescue personnel to Miyi, and have organized more than 300 people to help deal with the disaster. The Panzhihua city government has also given more than 1,000 blankets and allocated 500,000 yuan to help with the recovery.